I had the great opportunity to work with a classroom teacher most recently. Sure, you say, that is what Principals do. This was different. It was like undercover boss. I co-planned and co-taught with the teacher. This experience was different. Together the teacher and I hurried through some plans to delivery a background knowledge lesson on Making Connections. This was uncharted territory for both of us. What the teacher expressed as intimidation I expressed as anxiety. We were in this boat together! The interesting piece here is the result. Prior to working together the teacher, very honestly, articulated that she was quite intimidated by the thought that I was making qualitative judgements about her teaching along the way and that I may not respect her as a teacher when the lesson is through. I expressed the very same fear and was able to recognize that it was our ego talking. Post teaching the exact opposite was quite clear. I, very honestly, articulated the exact opposite of her initial fear. I respected and valued the work this teacher was doing 10 fold now that I had got into the trenches with her. Her willingness to team with the Principal, her ability to voice concern, her ability to reflect and her acceptance of coaching along the way all worked together to strengthen my qualitative judgements of her abilities as a “Learn Maker”. Something did come out of this for me. I realized, with her help, that I ask a great deal of questions. I have reflected on this much. Many of my colleagues and teachers alike would suggest that was my job! “You are supposed to ask the questions! If you don’t who will?” I can hear them say. This idea has not helped me reflect on why I ask the questions. Ah-Ha moment! Instead a fellow teacher hearing our debrief after the day was through commented, “Sir, you ask questions like a Gatling Gun!” We all laughed. I reflected. Do I ask questions to get them where I want them? Do I ask questions to get them to think deeper? Do I ask questions as a tacit effort to move them? or…….Do I ask questions to allow them to find their own way. 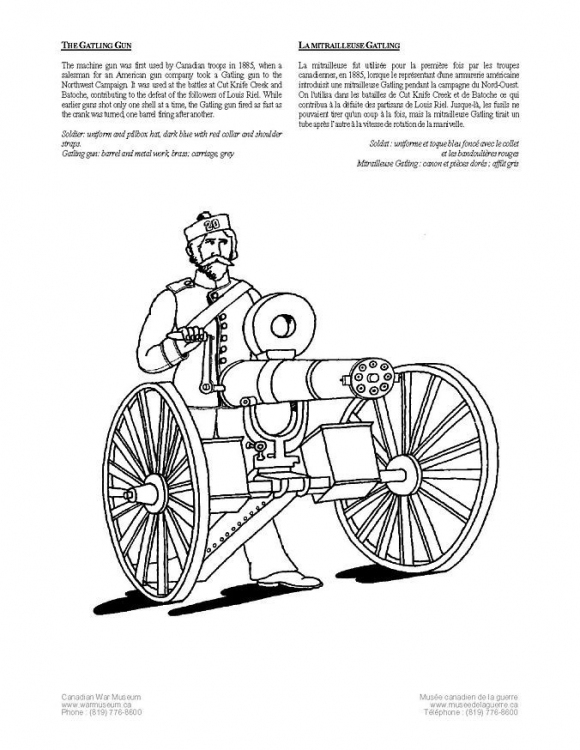 Print Your Own Gatling Gun Colouring Page if you too are reflecting on your questioning technique! I followed my experience up with a Skype call to a genius. A member of my larger PLN is a facilitation leader and thought leader on Protocols and Critical Friends Groups. I needed help. I understand that just by virtue of exploring my questioning techniques and motives I am headed up the right path. I have two resources that I can put into my “arsenal” to help me gain insight on my practise. I have a protocol that I will use in a PLC setting with my instructional coach to help my learning become more public (Focus Point-School Reform Initiative) and The Pocket Guide to Probing Questions is a reference that I will use to guide my reflection on my “Gatling Gun” like questioning quality. The experience was a rich one. The follow-up plan for the student work and achievement has already begun with the teacher I worked with. My continued work on providing teachers valuable feedback through a coaching stance is causing serious self-reflection about what school administrators can do to take the focus teacher instructional improvements for student achievement improvements to the next level.